When one first reads the below Daily Mail headline - you'd first think that these cowardly specks of human waste had received 20 years EACH for torturing a lone man with a crowbar, stabbing him with a broken bottle and battering him with a hammer - leaving the victim within inches of losing his life. But no - the British judicial system has become the laughing stock of the Western world with soft-headed Liberal judges repeatedly making a mockery of the word - justice. The light sentences are ludicrous and insulting to the law abiding British people. Human rights legislation is geared towards protecting SUB-humans - such as this group of gutless muslim scum ----cowards - only ready to 'battle' when they greatly outnumber the victim. Thus, we find the mainstream media headlining the combined jailtime for attempted murder - that would have succeeded in being a murder - had the police not intervened. A gang of thugs who stabbed a pedestrian in a road rage attack, torturing him with a crowbar, hammer and broken bottle have been jailed for almost 20 years. A 30-year-old man was subjected to a brutal attack after almost being run over by a car as he left a popular Indian restaurant in Whitechapel, east London. When the pedestrian swore at the driver in anger, he was confronted by three thugs who got out of the convertible BMW and another car following behind. Rashel Hussain, 20, and his friends, twin brothers Jubhare and Taharak Hussain, both aged 21, battered the victim with a crowbar, causing serious injury to his left hand. 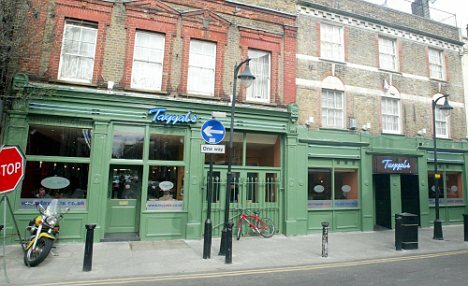 Terrified, the man ran back to Tayyabs restaurant - regarded as one of the best Indian restaurants in London - only to find himself trapped in the doorway as the doors had been locked by frightened staff. Taharak knifed the man a number of times before running off with the others to get more weapons. As the victim attempted to get help, stumbling towards the Royal London Hospital nearby, his attackers returned with a larger group of men who leapt on him. Rashel Hussain battered him with a hammer, while another man, Shah Alom, 22, slashed him with a glass bottle and two others, Jubhare Hussain and Shofiqul Islam, 21, rained down punches on the defenceless man leaving him with serious neck, arm and thigh injuries. The extraordinary onslaught of violence was caught on CCTV, which showed the bloodied victim desperately attempting to escape. Horrified members of the public who witnessed the attack around 9pm on Sunday, May 30 this year called 999 for help. Two police officers rushed to the scene and wrestled with the attackers, pulling them off the victim and saving his life. 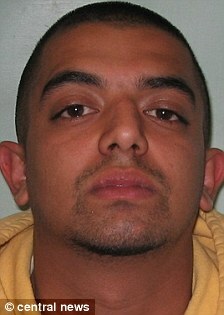 Rashel Hussain was arrested at the scene while the others fled. But detectives later rounded up the other members of the gang. On Monday they were sentenced to a total of almost 20 years at Snaresbrook Crown Court. Rashel Hussain, 20, was jailed for six years after pleading guilty to grievous bodily harm and violent disorder. 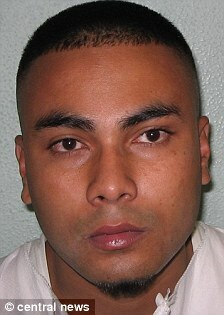 Taharak Hussain, 21, got seven years for grievous bodily harm. His non-identical twin Jubhare, 21, received a two year sentence for violent disorder. Two other gang members, Shofiqul Islam, 21, got a two year sentence and Shah Alom, 22, was sentenced to 27 months for violent disorder. The attack left the victim with horrific scars from deep wounds to his neck, arm and upper thigh. He is currently undergoing therapy after losing 60 per cent use of his left hand. Speaking after the sentencing, Detective Constable Darcia Babb said: ‘This was an outrageous and prolonged attack on a defenceless victim by a gang of thugs. ‘Extreme violence of this nature is rare but when it does happen we will make sure those responsible are brought to justice. It should have been 50 years apiece for the lot of these trashbags. And they've got families, so get them deported. They're not wanted nor desired here. You know what the funny thing is reading your so called'articles', that for some-one who has a great dislike for the religion islam and muslim people, you do dedicate quite a bit of your time and your energy writing about it. It's quite sad actually that this what you would spend your time doing. Oh how you must live a sad existence!!! These jihadists have been misled in the name of religion. We need to make them come back on the right track.